The overall aim of the regulation is to improve the sound insulation both between and within dwellings, as well as between rooms in hostels, hotels and residential homes. In practical terms what does this mean to you the developer , architect or specifier? Firstly if you are changing use of a property for example creating two flats out of one house or changing a retail space into living space then you will need to comply with regulation E.
You will be required to carry out the work to a regulation E standard, and then have a test on the work you have done to see that it conforms to the regulation E standard. This test is typically £650 to £750 + VAT and will involve the testing company generating a specific set of noises including generating impact sounds. These test results are then submitted and a pass or fail is generated. The test covers airborne and impact sound. a) Impact sound ( Lntw) whereby you must achieve an Lntw of LOWER than 64dB. Tables 1a to the right illustrate the airborne sound insulation and impact sound insulation values required in the various types of dwellings. Please note that in the case of airborne sound insulation, DnTw is the measurement used, however as low-frequency sound is the most difficult frequency range to stop a Ctr (correction factor) is used to take this into account. 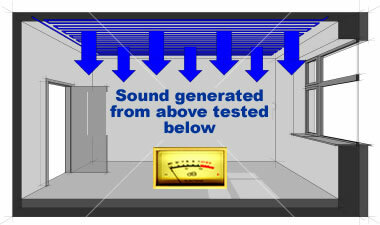 LnTw is measurement used to measure the impact sound insulation of floors (on site). With Airborne Sound, the higher the DnTw + Ctr figure the better, and with Impact sound the lower the LnTw figure the better. 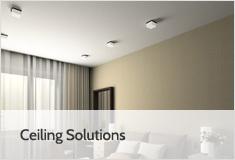 Our ceiling floor/solutions are aimed at predominantly timber floor constructions typically at conversions. Our wall constructions offer guidance on creating new separating party walls and upgrading existing walls to satisfy Part E.
Table 1a: Dwelling-houses and flats - performance standards for separating walls, separating floors and stairs that have a separating function. In Summary you need to achieve an airborne sound above 43 dB and an impact of below 64dB for conversions. To combat the problems of noise pollution the government has introduced new legislation. The new standards have been published in a new Approved Document-Part E (England and Wales) of the Building Regulations "Resistance to the Passage of Sound", which came into effect on July 1st 2003 for refurbishment and July 1st 2004 for new build. E1. Protection against sound from other parts of the building and adjoining buildings. E2. Protection against sound within a dwelling house. E3. Reverberation in the common internal parts of buildings containing flats or rooms for residential purposes. E4. Acoustic conditions in schools. To improve acoustics and therefore sound privacy between residential buildings. 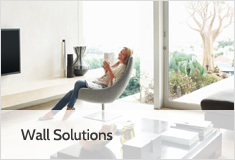 To improve the sound reduction of internal walls and floors within the home. To improve the sound reduction between rooms and in common areas in hostels, hotels, residential homes, schools and hospitals etc. To re-address sound performance criteria, taking into account day-to-day low frequency sounds such as TV, Stereo etc, TV was considered to be the main cause for complaint in the majority of the 180000 complaints about noise per year received by the Local Authorities in the UK. 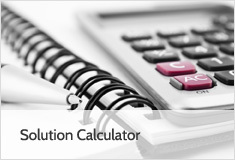 The testing requirement for new houses and flats came into force on 1st July 2004. © 2019 Sound Solution Ltd. All Rights Reserved.